Many out there are broke or almost broke and are looking for a way to change their financial habits. And managing your finances is difficult but not impossible, with a few tips and baby steps that’ll get you in the right direction, financial management is achievable. So here are some tips that’ll help you get control over your finances! Shop alone: Particularly if you are easily influenced by friends or family (children anyone? ), it probably better if you take that trip to the grocery store or shopping mall alone. That way you can make sure you’re only getting the essentials. Avoid impulse buying: Refrain from buying things on impulse. One of the best way to achieve this is by making a shopping list and sticking to it. Or even waiting a week or two to see if you still want that purse or outfit. Be a conscious consumer: Track your income and expenses. Find a great app like Every Dollar that will help you budget your spending and get things under control. Spend less than you earn: Try spending significantly less than you earn. Spending money is relatively easier than earning it. This creates the opportunity for saving and for emergencies as well. Stick to a budget: Make a budget and try your best to stick to it. Discipline yourself to faithfully follow your budget. Budgeting helps to set spending as well as saving goals. Invest: Learn to invest; you don’t have to be rich. Think of positive ways to grow your money through investments. We should also mention that you definitely do not have to start large. A small percentage of your income can be invested in a growing venture every month or week (depending on how you earn your wages). Make a savings plan: Saving is very good, try 10% to 20% from every paycheck, you will be amazed by the results. As the saying goes “pay yourself first!” Waiting till all other financial obligations are met is unhealthy for a savings plan. Maximize employment benefits: Take advantage of the employment benefits like your employers flexible account. These accounts significantly cut down tax liability. Wait for sales: If you want a particular item but don’t need it, wait till it’s on sale or at a discounted price. But make sure it’s something you need! Cheaper prices also attract customers to buy things they don’t need. Prioritize: Prioritize your needs, pay for the most important things first (after paying yourself), like water, utilities, and every other need that may belong in this category. 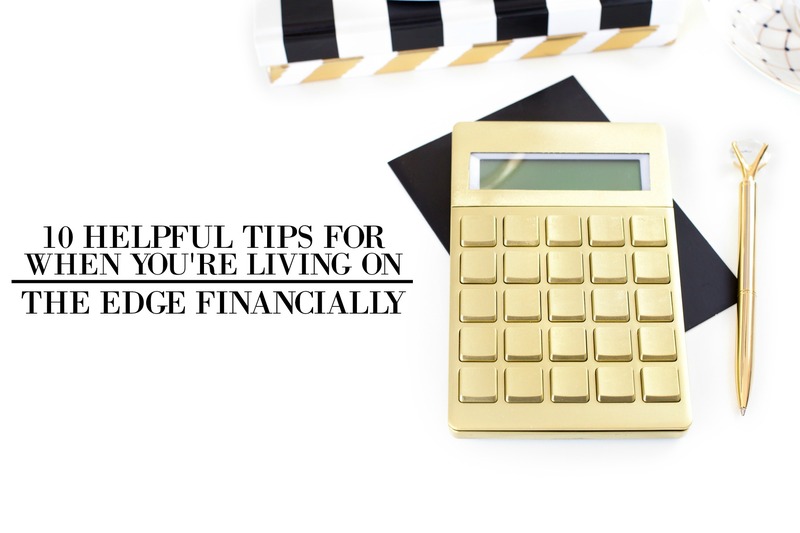 Though these tips are not exhaustive, these definitely provide a great way to move from living on the edge to a more comfortable position in the journey to financial freedom. This was so helpful! I think shopping alone is a good idea. It helps to think more clearly. Thanks for sharing! I agree that paying yourself first is best. It can be hard to see it that way, but it’s true! You are so welcome Vanessa!